Canal Street Chinatown decoration: A brief reminder that not everything in the world is terrible. On the Canal Street N/Q platform. I had my headphones on, slumping down the platform as usual, probably thinking about the electric bill or something, when the tile’s shine caught my eye. 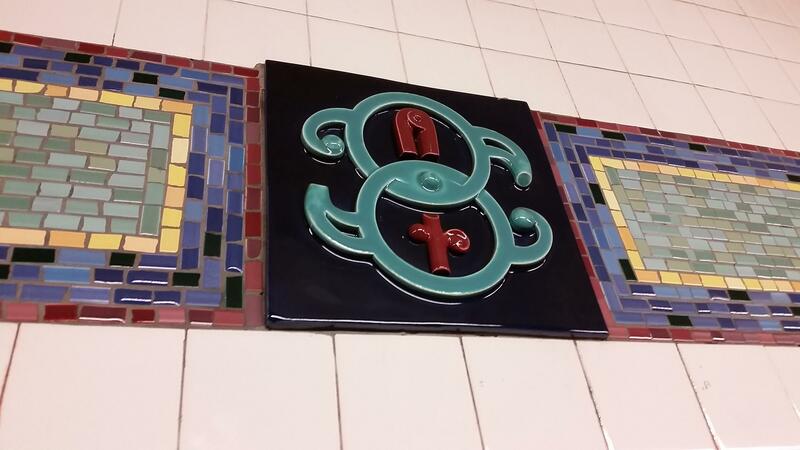 According to this site, it’s a ceramic tile from an installation called “Empress Voyage 2/27/1784” by Bing Lee, which celebrates “the arrival of the first ship from China to bring merchandise to New York.” It’s been in the station since 1998. Now, if you’re not from New York, it will help you to know that Canal Street is a notoriously messy and dirty strip of litter and car exhaust, and that the NYC subway system—while safe, potential visitors!—is not known for excessively meticulous custodial practices. The Canal Street station is mostly made of concrete and things that are chipping, peeling, and coming apart. But here is this tile, blue and turquoise, cleaned, shined, gleaming, cared about by at least one person, looking like it had just been born. It’s nice to see that kind of thing, now and then.